Den-Con has enlarged its line of Hinged Casing Spiders and Reducing Bushings with the addition of a full range of 200 Ton 4 taper Equipment. The 200 Ton 4 Taper Spiders range from 30” to 13 3/8” Body Sizes. Reducing bushings for these spiders are also available. 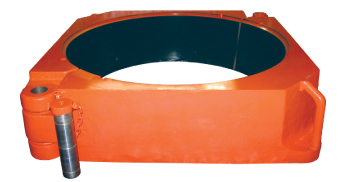 For customers with existing inventory of 3 taper 200-ton spiders, a full complement of 4 taper reducing bushings is available with 3 taper external dimensions to fit 3 taper spiders. EQUIPMENT SIZE PART # TAPER I.D. O.D.